I think this guy cut and pasted the sound instead of actually extending it like some of the other people do with Milton. The horrible effect is still funny though. Ah, THIS is how it's done! LOL at how insanely horrible it sounds! Four for the exaggerated sound file. It's funny largely because his voice is screwey. Leave it as it is. That "Staaaaaaaaapleeeeeeeer" part sounds similar to when a kid hears another kid speaks profanity, like "UUUUUUuuuuuuhhhhhhUUUUUUUUHHHHHHHH! You said the F-Word!" hahaha that was so great i busted out laughing! Stapler? 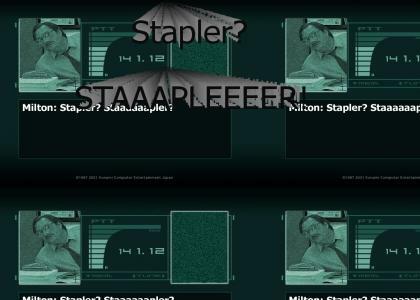 Stapler!? STAAAAAAAAAAAAAPLER!!!!! And oh yea... FIVED!!!! It sounds so synthetic, which is why it's amazing. you get a 4 only because it sounds liek Stapler, Staaaaapluuuuuuuuuuuuuuuuuuuuuuuuuurrrrrrrrrrrrrrrrrrrrrrrrrr!